Would you do laundry in the Central Park lake? 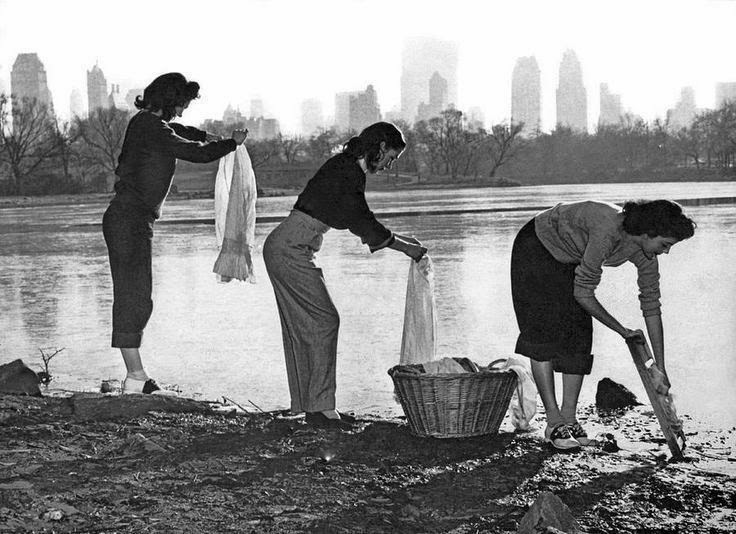 Would you wash your clothes by hand in the lake in Central Park? These three women did it, and they had a reason. December 16, 1949—the day the photo was taken—was “dry Friday” in New York City. Thanks to a severe drought that left upstate reservoirs at 34 percent capacity, city residents were forbidden to shave, bathe, or do any other activity that day if it required water. These three women—Copacabana girls, part of the East Side nightclub’s famous chorus girl lineup, per the caption on the photo—are demonstrating their patriotic duty to do laundry without any running water. 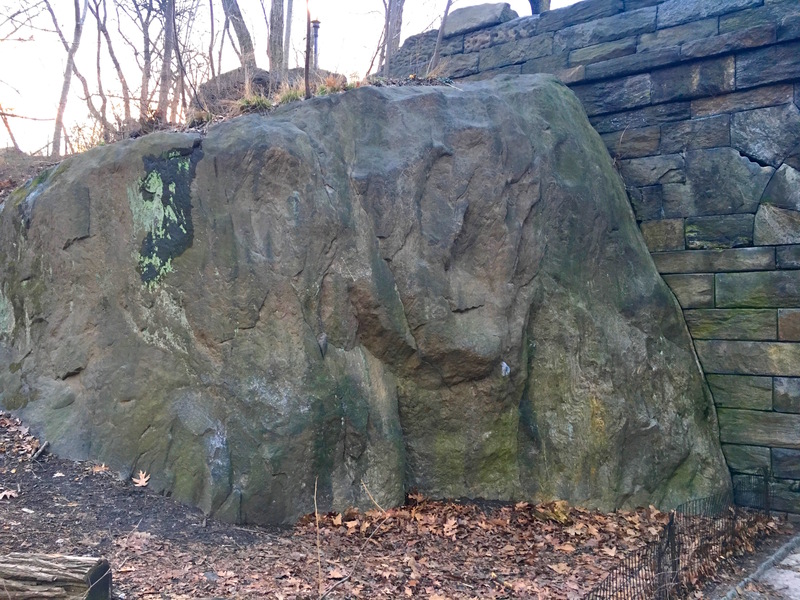 What happened to the sheep of Central Park? 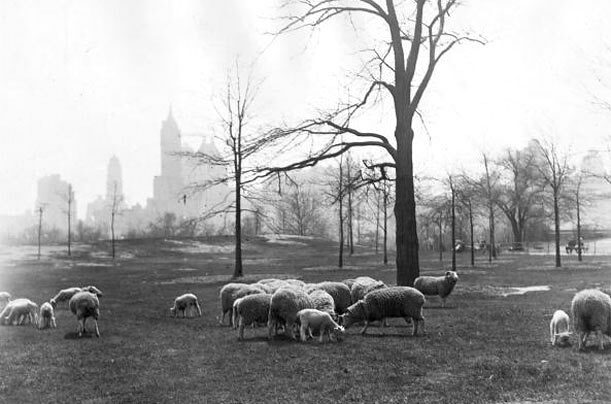 The idea to bring sheep into Central Park originated with Frederick Law Olmsted and Calvert Vaux back in the early 1860s. The two brilliant co-designers of the city’s first major green space wanted part of the landscape to feel pastoral and serene. Having a flock of sheep roaming around, they reasoned, would give the area a romantic, English countryside-like feel, according to NYC Parks. 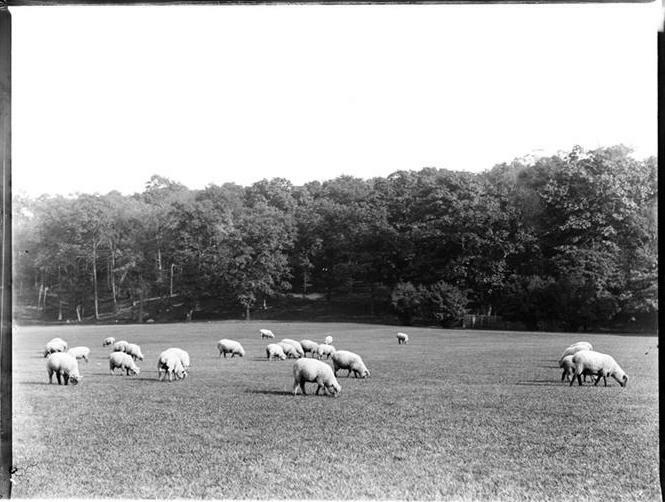 And of course, the sheep would cut the grass — a nice side benefit in an era before motorized lawn mowers. 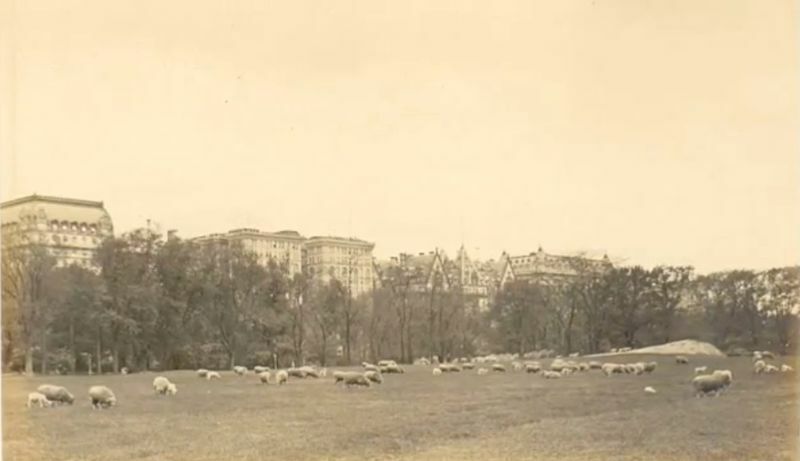 So in 1864, about 200 pedigreed English sheep were moved into the newly opened park, their grazing ground appropriately renamed Sheep Meadow. 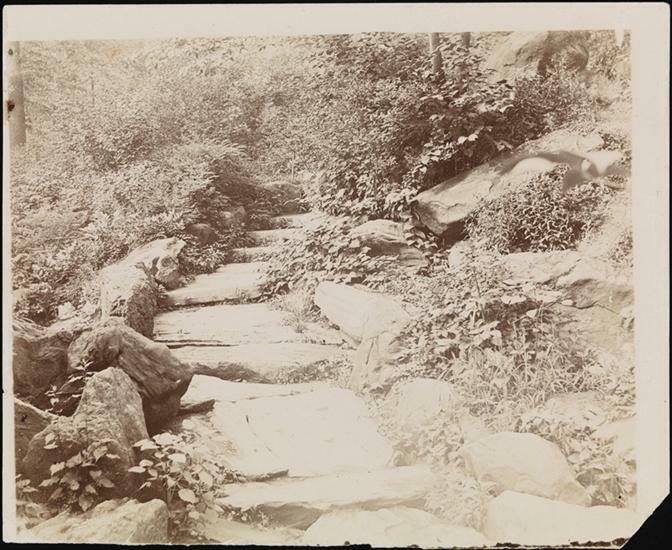 Jacob Wray Mould, who designed many of Central Park’s loveliest structures as well as the carvings along Bethesda Terrace, built a Victorian-style sheepfold near West 64th Street (at right, in 1884) that housed the flock at night as well as a human shepherd and his family. 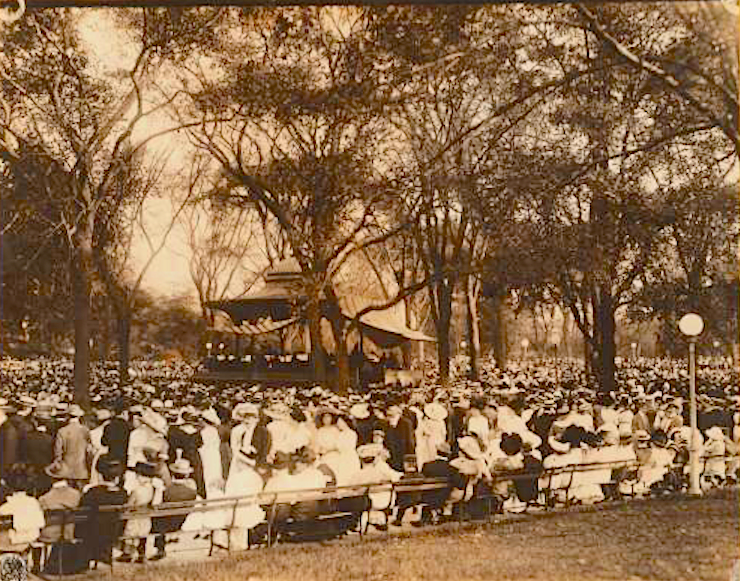 For decades, the sheep shared the park with people. They left their fold at 5:30 a.m. and returning at half past six in the evening, with the help of a sheepdog assistant named (of course!) 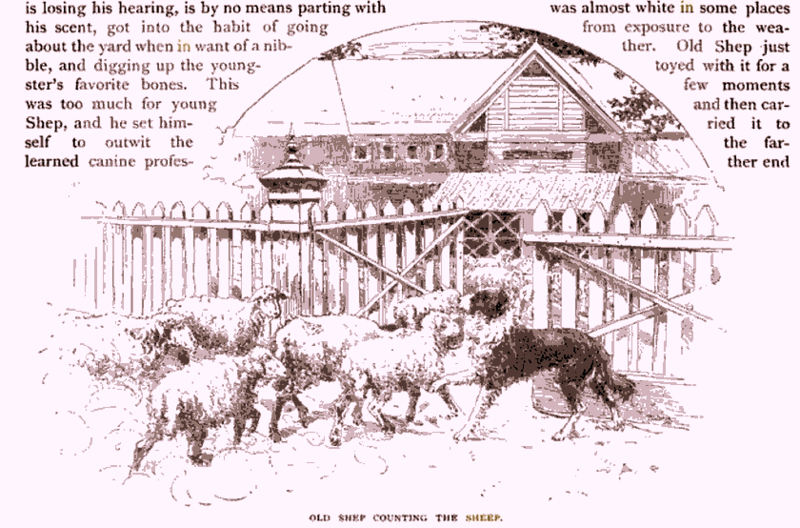 Shep, reported the children’s magazine St. Nicholas in 1884. “Twice a day, the shepherd would disrupt traffic (first carriage, then car) while herding the sheep over a crossing, towards the meadow,” wrote Modern Farmer in 2014. The beginning of the end of the sheep came with the appointment of Robert Moses as Parks Commissioner. 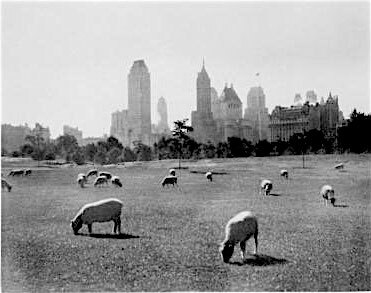 He altered Central Park by building playgrounds and ball fields — and in 1934 decided the sheep had to go. 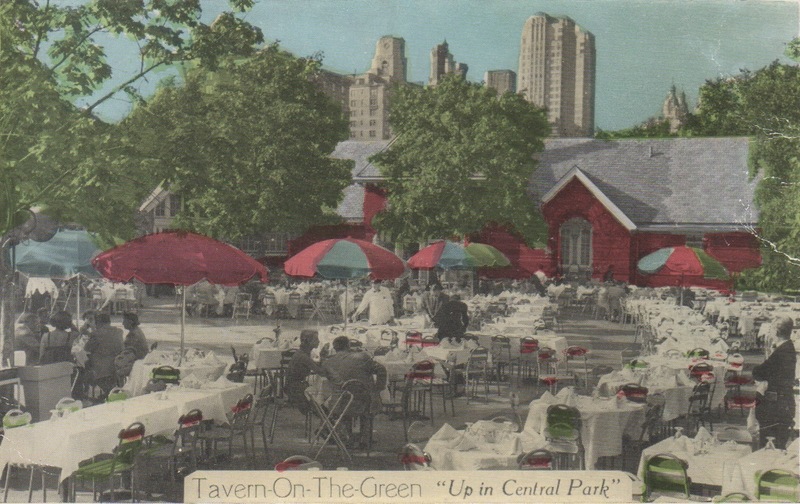 For one, Moses wanted to make the Victorian-style sheepfold a restaurant (it later became Tavern on the Green, at right). But his decision also had to do with the Great Depression and the very real fear that desperate New Yorkers (some of whom moved into the park in a row of shacks nicknamed Hooverville) might turn the sheep into lamb stew. 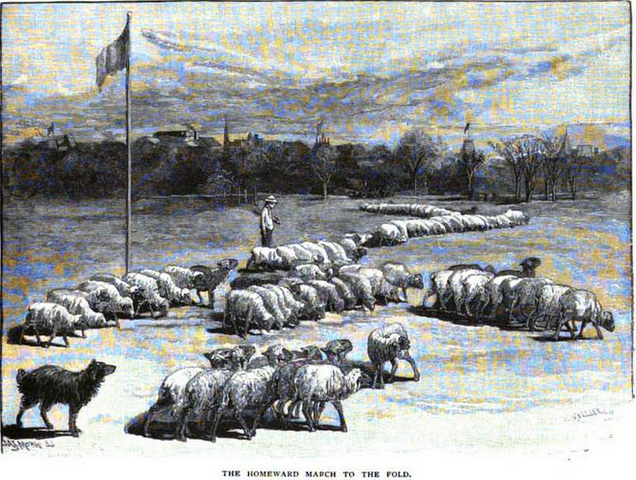 So the 49 remaining sheep were dispatched to join another flock (above, around 1900) in Prospect Park. There, they grazed in the Long Meadow before being moved again, permanently — this time to the Catskills. Completed in 1863, Bethesda Terrace was one of the first structures to go up in Central Park—and it’s also one of the most breathtaking, with its grand, intricately carved staircases connecting park visitors to the expanse of the Mall. Of course, his may have been of no interest to post-Impressionist painter Maurice Prendergast. 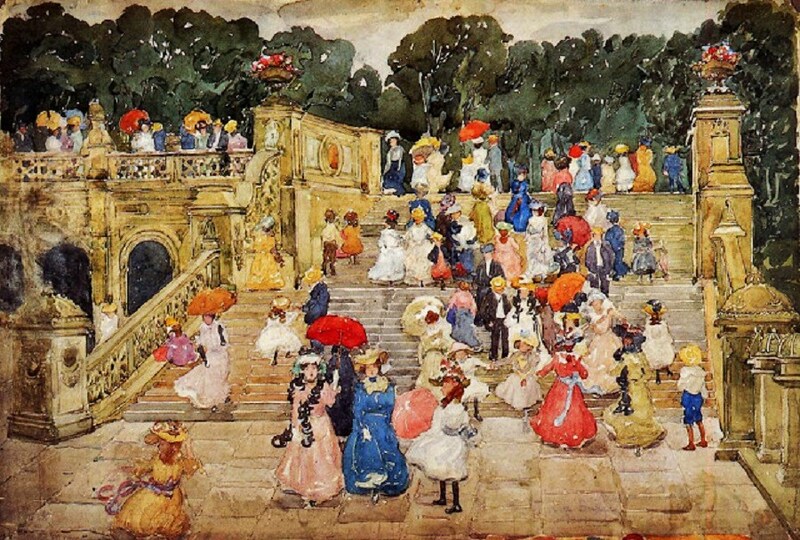 He simply may have been struck by the sight of so many women (and some kids, plus a few men) gathered at the Terrace steps, almost all in brightly colored dresses shielding themselves from the sun under parasols. It started as an informal promenade in the 1870s, when New York’s most prestigious churches—like St. Patrick’s and St. Thomas, both on Fifth Avenue—began decorating their interiors with beautiful floral displays in honor of Easter. Churchgoers dressed in their Easter Sunday best would visit different houses of worship to admire the flowers, explains author Leigh Eric Schmidt in Consumer Rites. 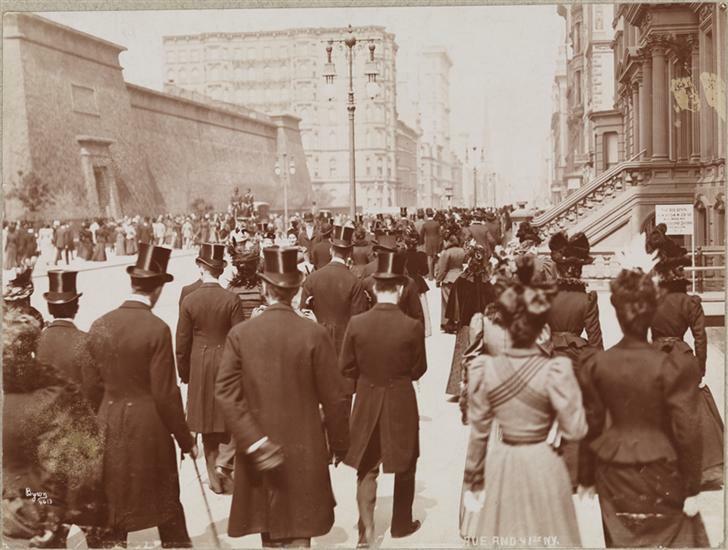 By the 1880s, this post-service visiting transformed into a loosely structured parade, with the fashionable and well-to-do strolling in the early afternoon on Easter Sunday up and down Fifth Avenue, from Madison Square to Central Park. New Yorkers loved the spectacle. “Fashion bursting from its sack-cloth and adorning itself in new and beautiful garments,” the New York Times front page read on April 11, 1887, the day after Easter. 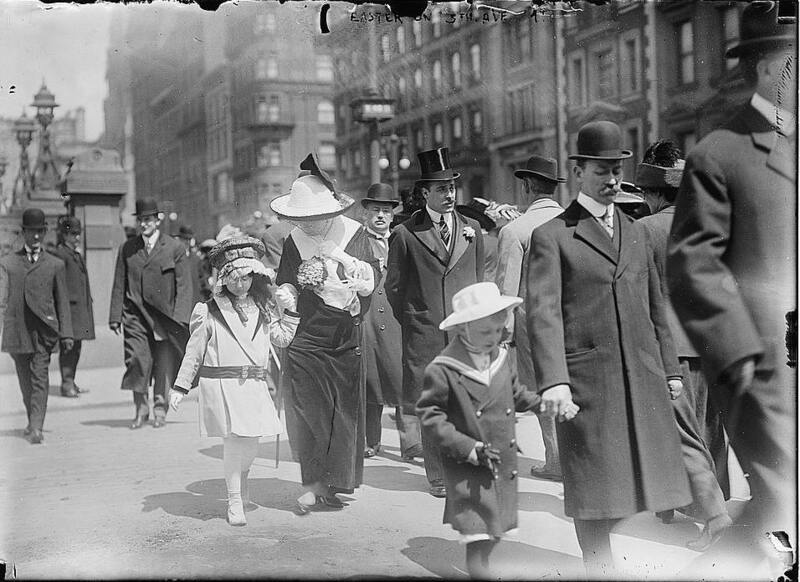 The Easter Parade was partly a ritual shaking off the chill of winter, but it was also the Gilded Age version of a fashion show, with Fifth Avenue sidewalks as the runways. “The men were all in sober black save when at times the irreverent dude lit up the street with a gridiron shirt and a sonorous necktie,” the Times continued. While you can’t tell from the black and white photos, these female parade-goers were decked out coats and dresses covering every color of the rainbow. The crowds moved at a crawl all afternoon, dissipating as the temperature rose only to swell again in later in the day as the sun began to set, the Times reported. 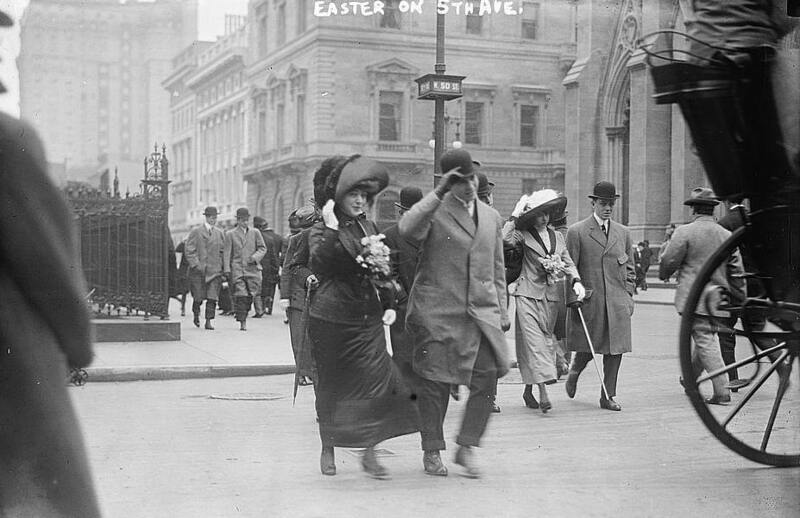 New York actually still has an official Easter Parade on Fifth Avenue, and it’s open to everyone, not just the upper crust. But it doesn’t command the attention it did until the 1940s and 1950s, when the tradition was mostly replaced—by real spring fashion shows, egg hunts, and the beloved New York tradition of long Sunday brunch. 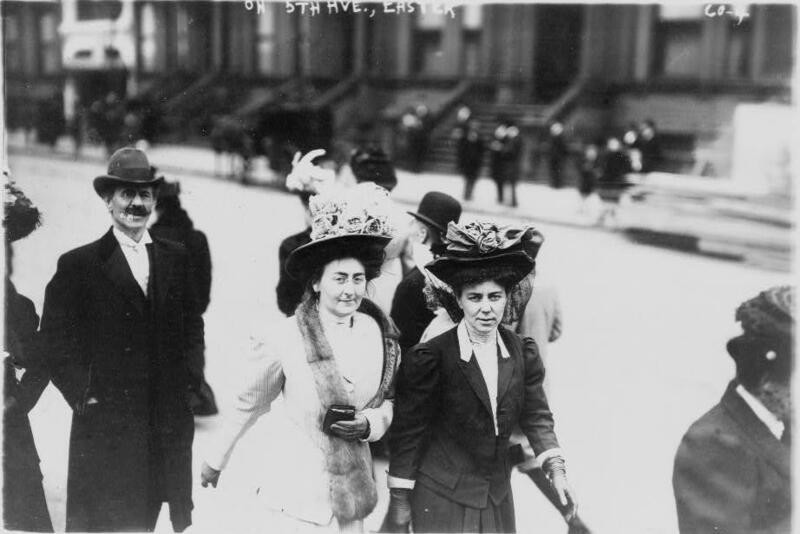 The Gilded Age in New York, 1870-1910, has more on the humble beginnings of New York’s favorite holidays. 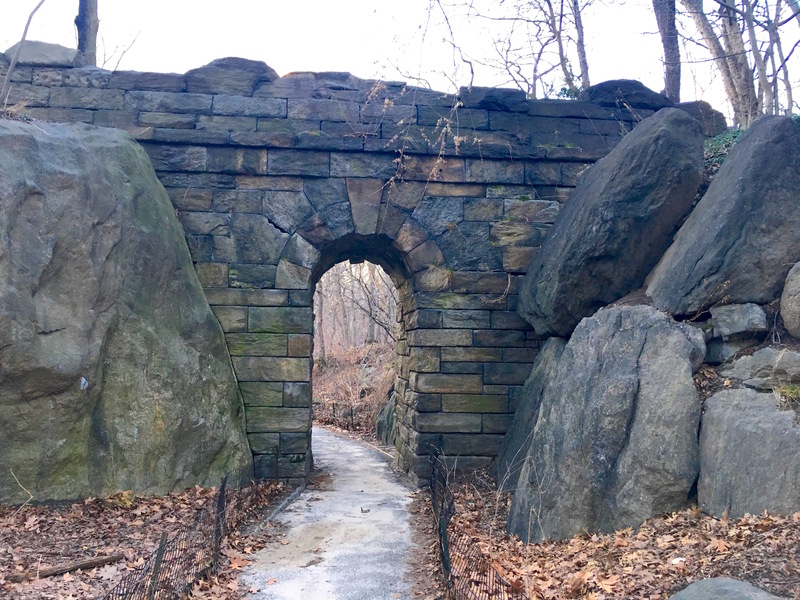 It’s known as the Ramble Cave or Indian Cave, its remains viewed today from a footpath through the Ramble Arch in the woodsy, boulder-strewn Ramble section of Central Park, just below 79th Street. Unfortunately for urban explorers, both ends of the cave (one was accessible through the lake, the other beside the Ramble Arch) were sealed in 1934. Yet in the years it existed, it earned an early reputation as a place of fun and adventure—then something more disturbing. The cave was also tinged with romance, a “bold and romantic rock chamber” as an 1861 Harper’s Monthly article described it. “It is a romantic rock fissure, which opens northward at the base of the western slope of the Ramble, and southward upon a little arm of the lake,” stated an 1866 guide. It might also be the same “wild but beautiful” cave where one 15-year-old runaway hid for a month in 1897, worrying her immigrant parents before being found by police, sitting on a rock and soon forced out. 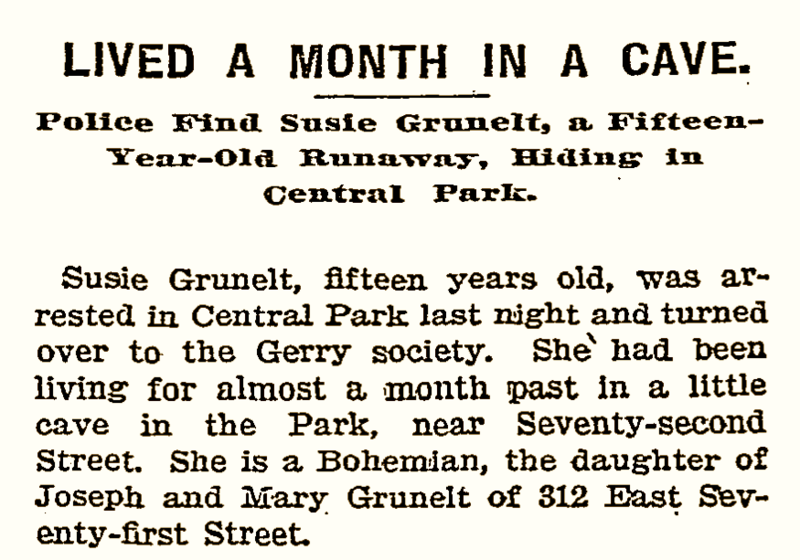 But after the turn of the century, based on newspaper accounts, the cave gained a darker edge. 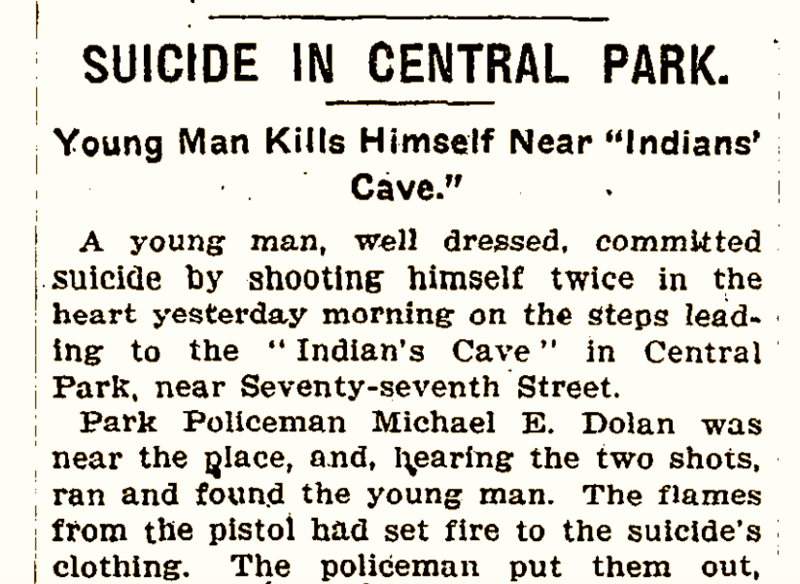 In 1904, an artist was found guilty of disorderly conduct after another man, a baker, claimed that the artist walked him to the “Indian Cave” with the intent of robbing him. And in 1908, another man slit his throat with a razor there, telling a cop, “one of the sparrows told me to do it,” according to the Sun. All of this unsavory activity led park officials to shut the cave off to the public. The lakeside opening was bricked off and the Ramble entrance blocked by boulders and dirt. 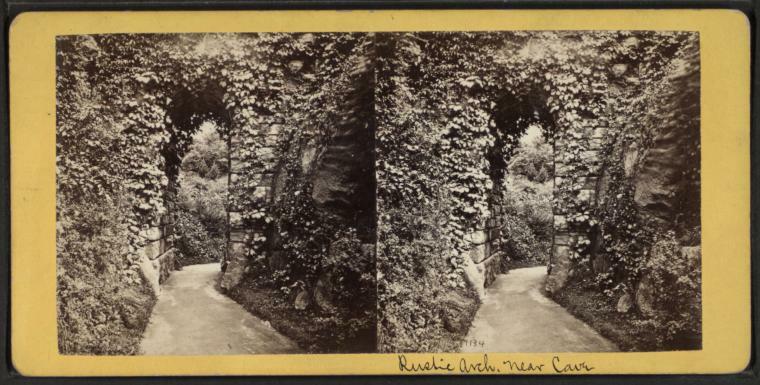 Walk by the Ramble Arch today, and you wouldn’t know a cave used to be here—though the remains of a staircase that once led to it can be seen by eagle-eyed explorers. 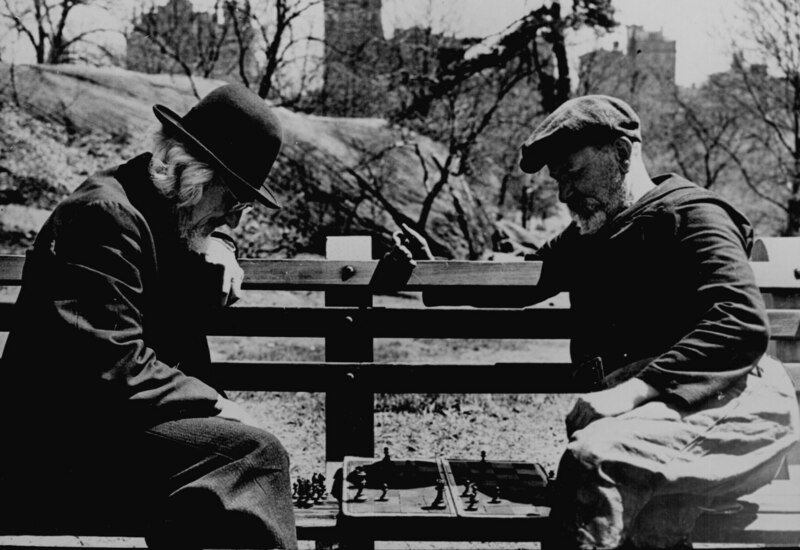 Time stands still in this May 1946 photo, which captures two “old timers,” as the caption states, immersed in a game of chess while surrounded by the beauty and tranquility of Central Park. Perhaps they were among the former residents of Central Park’s Depression-era Hooverville, a pop-up city of shacks and forgotten men? It’s part of the digitized American Cities collection at the National Archives, which deserves a long thumbing through. 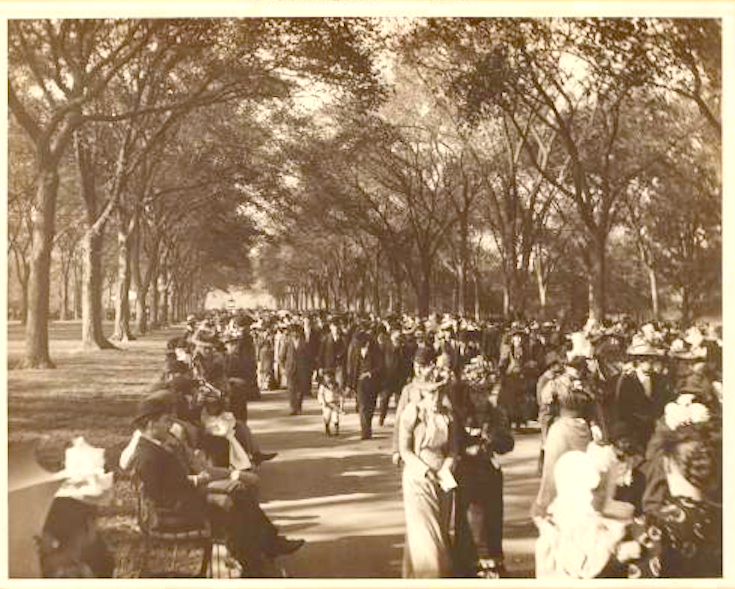 Chess wasn’t the only game older men played in New York City parks. Bocce courts ruled parks in Italian-American neighborhoods, with groups of often Italian Americans crowding green spaces in Lower Manhattan. On a January day, 12-year-old Naomi King and her parents left their Indiana home for a vacation in New York City. After arriving and meeting up with Naomi’s older sister Josie, a Manhattan resident, the family settled into the West 118th Street home of their host, a Mrs. Purdy. 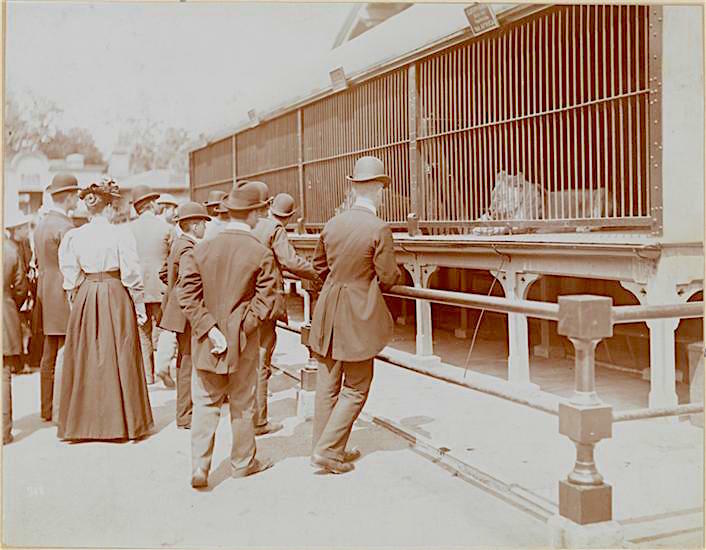 Through early February they did what most first-time tourists do: they visited museums and Central Park (left), window-shopped stores, took in the Bowery, and saw the seashore at Coney Island. 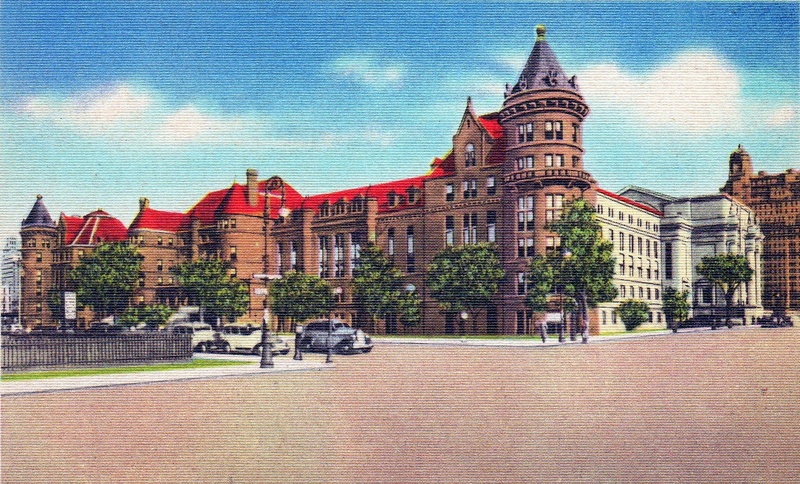 What makes King’s visit so unique is that it occurred in January 1899. 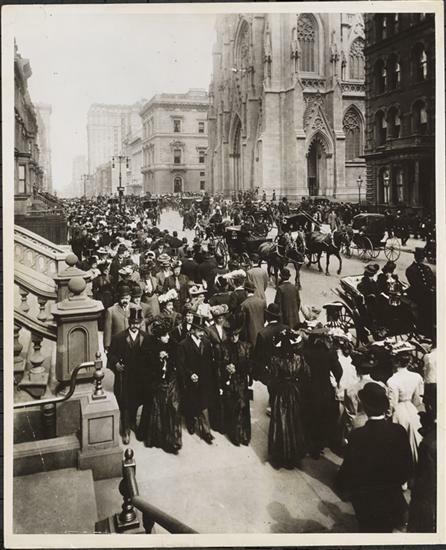 And because King kept a travel diary (part of the Archives & Manuscripts Collection at the NYPL), contemporary readers get to experience the Gilded Age city as it appeared through her impressionable eyes. Like any trend-driven tween, King wrote about the clothes displayed in stores like Stern’s (top image) in the Ladies Mile shopping district. 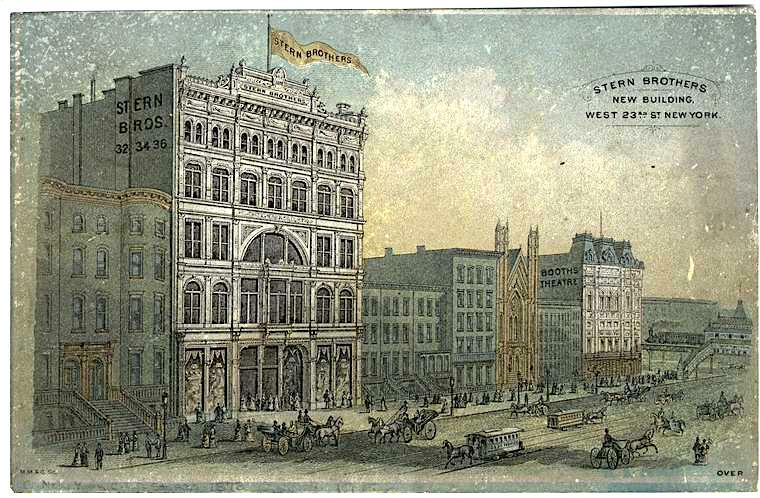 “We got off [the Broadway car] at 23rd Street and Josie took us to the Stern Brothers, one of the large and select dry goods houses where we saw the latest fashions,” she wrote. For reasons that aren’t clear, the family visited some of the city’s notorious charitable institutions, which King wrote about movingly. 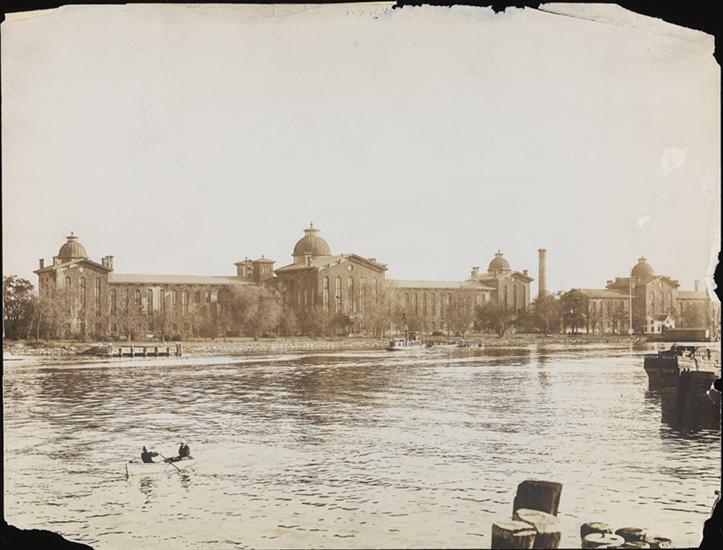 On Randall’s Island at the House of Refuge (below), kind of a 19th century reform school, she saw boys working in the institution’s laundry department. Also on Randall’s Island, she was distraught by a hospital for abandoned babies—a terrible problem in the post–Civil War city. What became of King after her visit I wish I knew. But her travel diary stands as a testament to the wonder and tragedy of New York on the cusp of the 20th century. The Gilded Age in New York includes these excerpts from King’s diary—as well as diary excerpts from other New Yorkers of the era. Many thanks to the NYPL for permission to cite the text in the book. What is it about skating that captivated so many New York City illustrators and painters during the 19th and early 20th centuries? It could be the challenge of capturing the motions of skating, the gliding or rolling skaters do, kind of an unchoreographed dance even the clumsiest person can master. 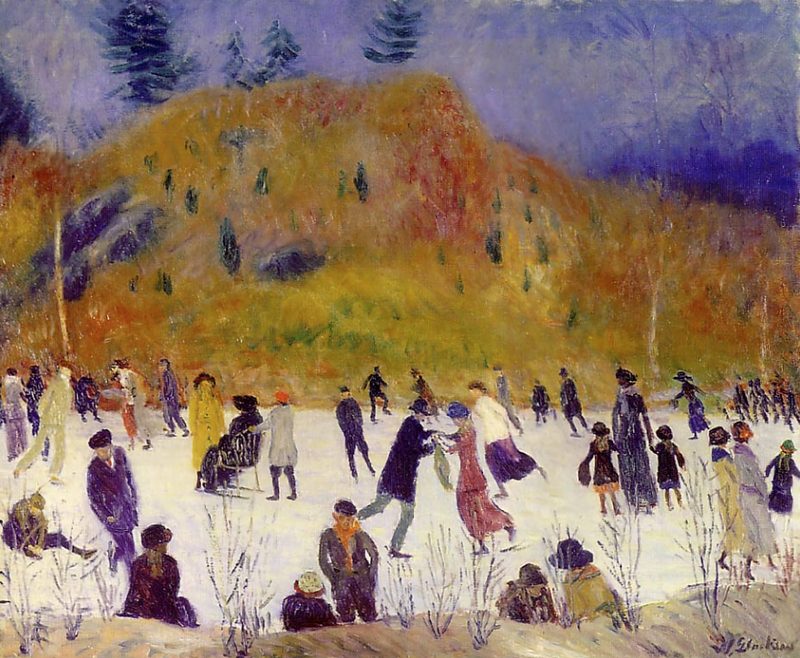 Or perhaps in the case of ice skating, artists can’t resist the glorious winter colors that frame New York’s frozen ponds and lakes. Skating might also have been seen as a little risque. During the Gilded Age, ice skating was one of the few social activities men and women could do together without upsetting the boundaries of the era’s gender-specific spheres. 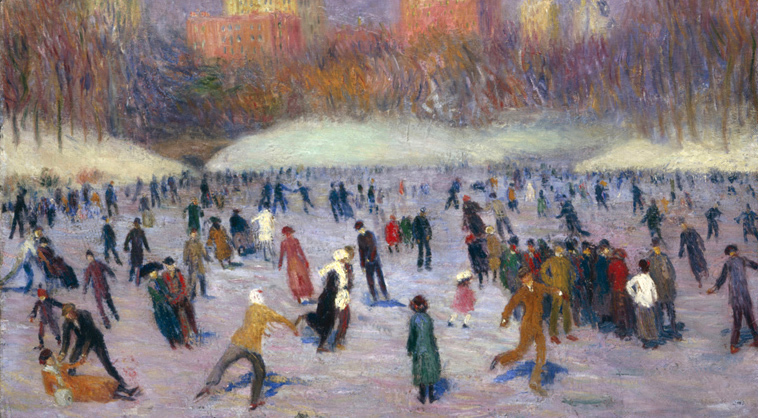 Ashcan School artist William Glackens painted these three images of New Yorkers on skates. He may have simply enjoyed depicting spirited scenes of day-to-day life in the city where he lived and worked (his studio was on Ninth Street off Fifth Avenue). 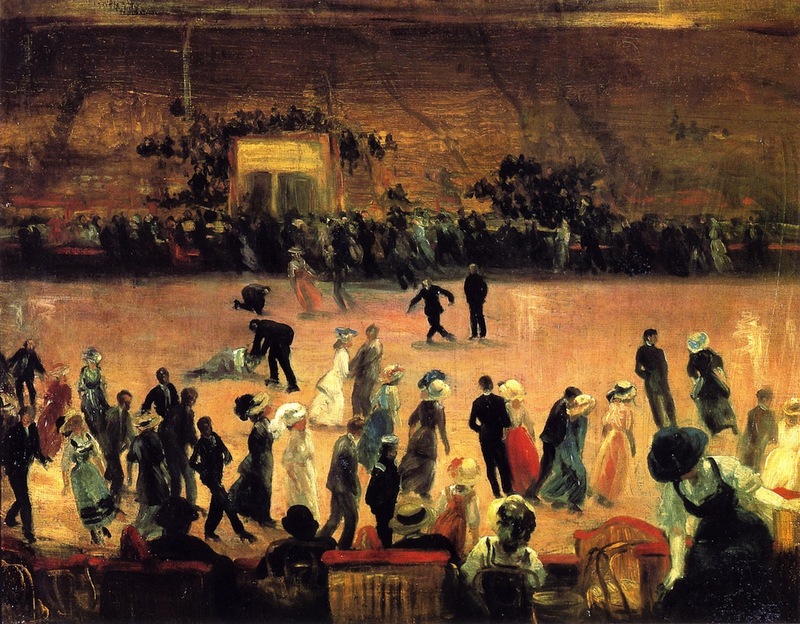 The roller skating rink painting, however, stems from an actual trip to a city rink Glackens made with Robert Henri and other Ashcan painters. “The hilarious evening, in which Glackens was the first to fall, encapsulates the artist’s fascination with the modern city and its popular attractions,” wrote the Philadelphia Museum of Art, which has this work in its collection. 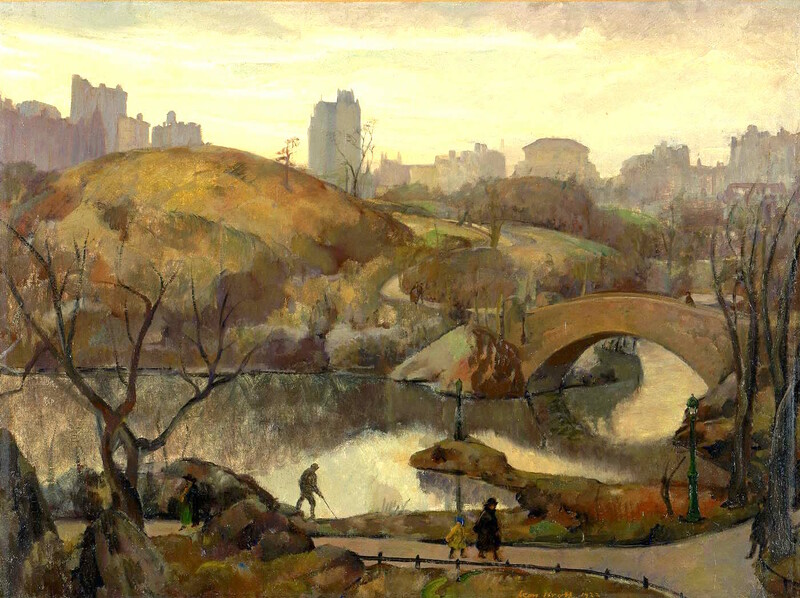 Leon Kroll’s “Scene in Central Park” gives viewers the park as he saw it in 1922. It must be winter, or close to it: the landscape is all orange and brown and green amid bare trees. Now the question is, which bridge is this. Gapstow over the lake? Think wistfully about the Upper West Side of the past, and enormous rent-stabilized apartments, independent bookstores, and grittier streets might come to mind. But for the members of a group called Ye Olde Settlers’ Association of Ye West Side, the neighborhood they mourned was a bucolic one of farms and country estates. That’s because the Ye Olde Settlers were the original Upper West Side old-timers. 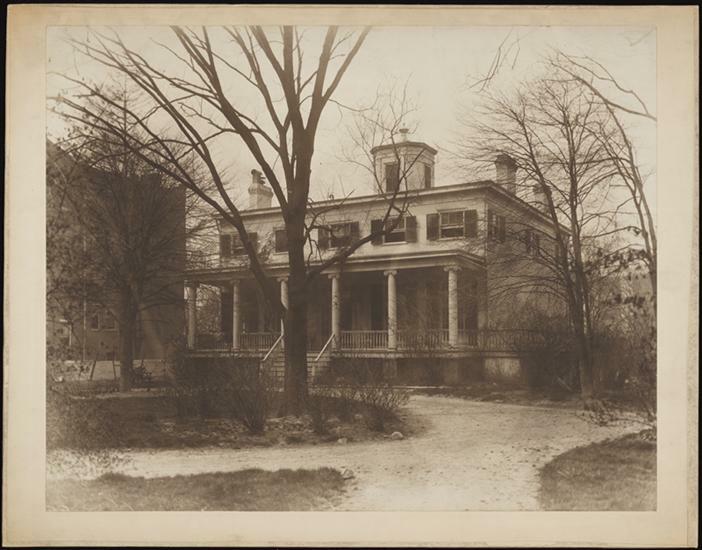 The 80 founders had lived in small villages like Bloomingdale and Harsenville in the 19th century. 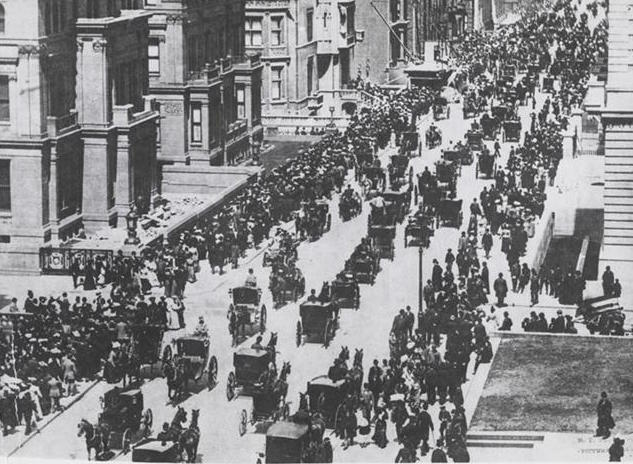 As the city’s population ballooned, they watched their stretch of Manhattan get carved up, paved over, and urbanized—all within a few decades. And just like longtime New Yorkers do today, these senior citizens enjoyed getting together to talk about the good old days in the ‘hood. 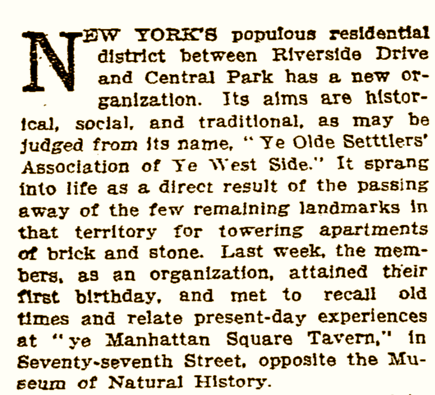 “Once a year that young but thoroughly New York organization known as Ye Olde Settlers’ Association of Ye West Side holds a dinner and induces many of its members to give reminiscences of the days when houses were few, apartments were none, and transportation on the West Side was chiefly accomplished by old-fashioned horse cars on Eighth Avenue…” wrote the New York Times in January 1915. What exactly did they gather to remember? 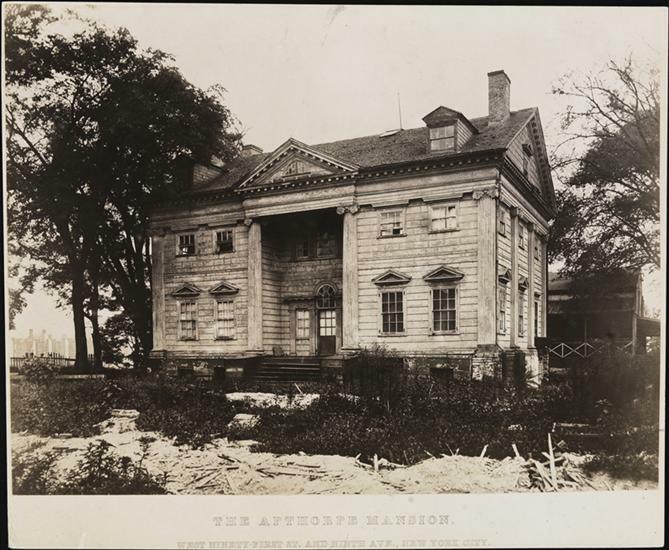 The Apthorp farm for one, with its stately mansion. 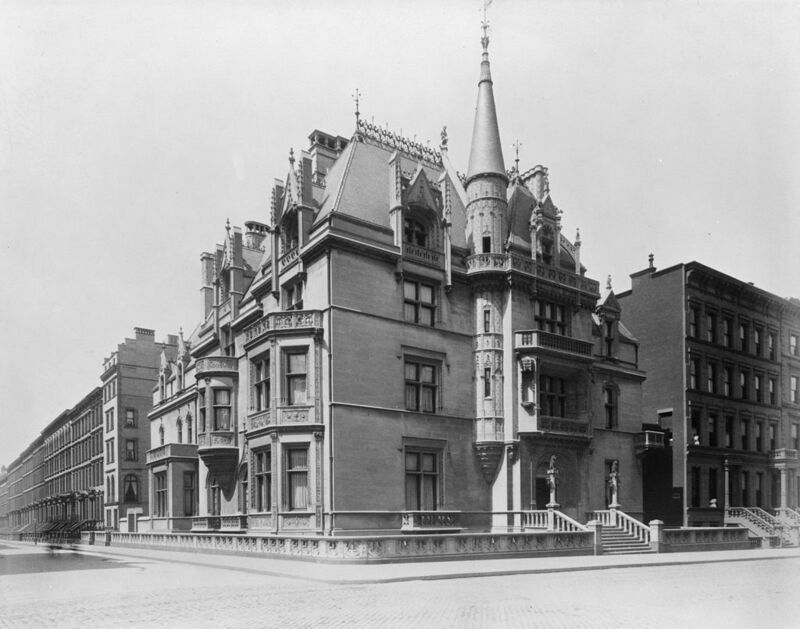 In 1908, the Apthorp apartment residence replaced the farm on West End Avenue and 78th Street. 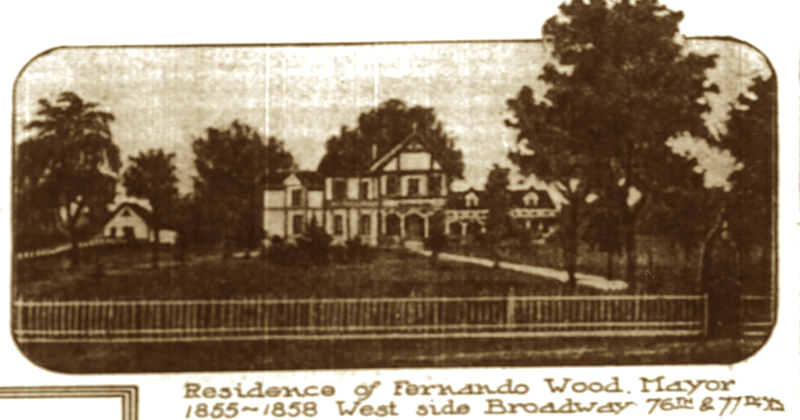 They also recalled Manhattan Square (created before Central Park at 77th Street, now the site of the Museum of Natural History), mayor Fernando Wood’s estate (Broadway at 76th Street), and the Furniss estate (Riverside Drive and 100th Street). Formed in 1911, Ye Olde Settlers published yearbooks (with some fascinating historical tidbits) into the 1920s. But like the West Side of old, the group died out without ceremony.